Chinese Ambassador to Cambodia Xiong Bo. This year marks the 60th anniversary of the establishment of the diplomatic ties between China and Cambodia. With Sino-Cambodian relations welcoming a new era of steady development, both countries have become good neighbors, brothers, friends and partners to each other. Recently, Chinese Ambassador to Cambodia Xiong Bo sat down for an exclusive interview with China Report ASEAN to elaborate on past achievements and future development potential for bilateral relations, as well as people-to-people exchange and business cooperation. China Report ASEAN: What are some of the achievements in China-Cambodia cooperation? 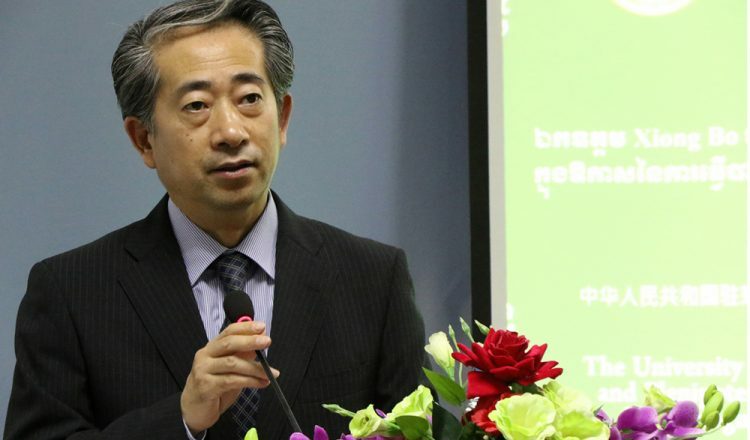 Ambassador Xiong Bo: Over the past six decades, traditional friendship between China and Cambodia has become increasingly consolidated, demonstrating new vitality under new circumstances and adding momentum to the development of bilateral relations. In recent years, the Sino-Cambodian comprehensive strategic cooperation partnership has seen continuous progress, and the two countries have become real good neighbors, dear brothers, close friends and trusted partners. Mutual trust between the two countries has deepened. In October 2016, Chinese President Xi Jinping paid a state visit to Cambodia, foreshadowing a new bilateral comprehensive strategic cooperation partnership that fosters high-quality growth. In January 2018, Premier Li Keqiang made a trip to Phnom Penh where he co-chaired the 2nd Lancang-Mekong Cooperation (LMC) Leaders’ Meeting with Cambodian Prime Minister Hun Sen and paid an official visit to Cambodia, injecting fresh impetus to China-Cambodia relations. Both countries have worked to accelerate alignment of respective development strategies. In May 2017, the two sides signed Outline Plan for Jointly Promoting Cooperation on the Belt and Road Initiative and several other documents, agreeing to expand pragmatic cooperation in the fields of trade, investment, connectivity and energy resources. This move has proved key in helping Cambodia accelerate economic development, increase employment opportunities, alleviate poverty and improve living standards, winning universal acclaim from wide-ranging circles in Cambodia. China and Cambodia have strengthened cooperation in international and regional affairs. Based on high-level political consensus and mutual trust, both sides provide each other understanding and support on issues concerning core interests and major concerns, joining hands to maintain regional peace, stability and development. China Report ASEAN: This year marks the 40th anniversary of China’s reform and opening up policy, and Cambodia has also reached a crucial stage of development. What development opportunities should be seized by the China-Cambodia partnership? Ambassador Xiong Bo: Based on the tremendous achievements under its belt over the past 40 years of reform, China is endeavoring to open wider to the outside world and attaching equal importance to attracting foreign capital and boosting outward investment. Cambodia is expected to become an important destination for Chinese overseas investment. Cambodia has some of the greatest vitality and development potential in the region, after registering a 7 percent economic growth over the past two decades. Currently, the Cambodian government is advancing the third phase of its Rectangular Strategy for growth, and the accelerated industrialization and urbanization has raised demand for infrastructure, investment, technology talent and other developmental resources that are deficient in Cambodia but abundant in China. Taking advantage of their complementary economic traits during work on joint construction of the Belt and Road Initiative, the two countries are finding tremendous potential for further mutually beneficial cooperation in multiple areas. China Report ASEAN: Following Chinese President Xi Jinping’s proposal to build a community with a shared future for mankind, this January China presented the idea of creating a community of shared future with Cambodia that is of strategic significance. In which areas do you think the two countries can conduct cooperation in this regard? 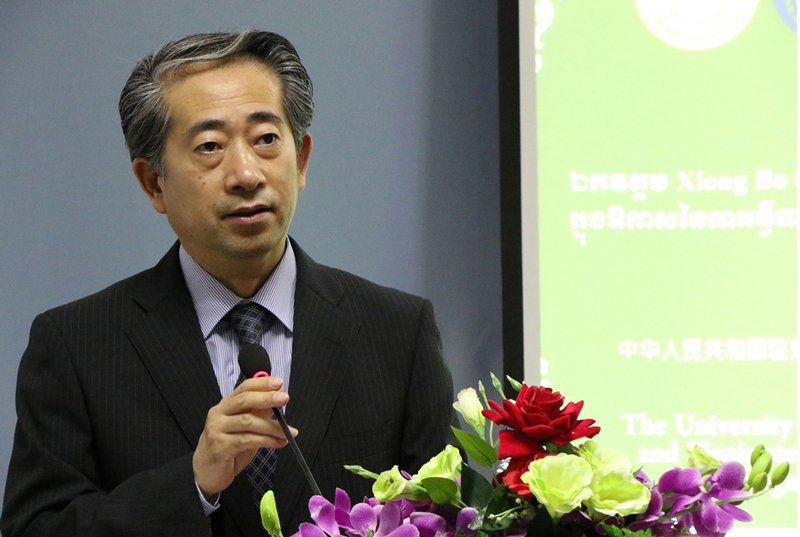 Ambassador Xiong Bo: China and Cambodia have long been traditionally friendly neighbors. Since the establishment of bilateral diplomatic relations in the modern era, both countries, though contrasting in size and state system, have adhered to the Five Principles of Peaceful Coexistence, insisting on mutual respect, equal treatment, mutual understanding and mutual support. It is fair to say they have set the pace for a new type of international relations and played a pioneering role in building a China-ASEAN community of shared future and an Asian community of shared future. Significant contributions have been made by the two countries to develop the LMC mechanism. Both sides have worked together to strengthen unity and cooperation between China and ASEAN, support ASEAN’s central position in regional cooperation, promote the construction of the East Asia Economic Community with ASEAN+3 (China, Japan and South Korea) cooperation mechanism as the main channel and oppose outside forces interfering with or impeding regional cooperation and development. China supports Cambodia playing a greater role in regional and international affairs as well as strengthening bilateral coordination and cooperation in related fields in an effort to consolidate the Sino-Cambodian comprehensive strategic cooperation partnership. China Report ASEAN: People-to-people exchange serves as a bridge to mutual understanding and friendship. In which areas do you think the two countries should make efforts in this regard? Ambassador Xiong Bo: People-to-people exchange is a traditional pillar of China-Cambodia relations. Both sides have seen a continued increase in the flow of students studying in each other’s country. China trains about 200 various professionals yearly for Cambodia, and so far, more than 2,000 Cambodian students have studied in China under the Chinese Government Scholarship Program. During his 2016 state visit to Cambodia, President Xi announced that in the coming five years, the Chinese Government Scholarship would sponsor an additional 500 Cambodian students. Each year, China also dispatches nearly 200 staff and volunteer teachers to the Confucius Institute in Cambodia to support Chinese education. Discussions on higher education cooperation between the two sides are underway. Cultural exchange can effectively promote mutual understanding between the two peoples. In recent years, the Chinese Embassy in Cambodia has sponsored screenings of outstanding Chinese and Cambodian movies in both urban and rural areas of Cambodia on a yearly basis, a program which has generated a warm response from locals. A number of Chinese heritage experts have relocated their workplaces to Cambodia to contribute to the restoration of Chau Say Tevoda, Ta Keo and other architectural relics of the Angkor temple complex. The Confucius Institute at Royal Academy of Cambodia not only provides an important platform for Cambodian youth to learn Chinese, but has also launched Chinese classes targeting Cambodian government departments, which have gained wide popularity. Tourism cooperation between the two countries has flourished. Last year, Chinese arrivals in Cambodia topped 1.2 million, a year-on-year increase of 46 percent. Each day, nearly 40 flights shuttle between a dozen Chinese cities and Cambodia, enabling increasing numbers of people on both sides to experience each other’s historical and cultural legacies more intimately as well as engage in parallel modern development. Medical care remains a priority of Chinese aid to Cambodia. This year, China formally launched the “China-Cambodia Love Heart Journey” program, aiming to provide 100 Cambodian children suffering from congenital heart disease free surgery in three years. As other aid projects such as the construction of the China-Cambodia Friendship Medical Building and the Tboung Khmum Province Hospital are progressing steadily, mobile clinics are providing care to millions of Cambodians alongside the volunteer Chinese medical teams that have toured to Cambodia multiple times. We are always willing to extend our helping hand to the Cambodian people and will continue to support improvements in Cambodia’s public health.